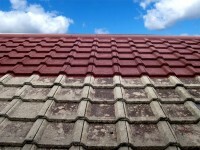 When hiring someone to clean your roof consider the following. Have you ever heard of this company, how long are they around? Is their insurance up to date? Ring the Insurance Broker to confirm. If you have a slate roof will they get on the roof to clean it? We can clean it from the gutter line without getting on the roof. Are they using safety equipment such as harnesses, a system of securing themselves whilst working on the roof, a rescue system in the event of an emergency? Indiscriminate use of a pressure washer will damage your roof and it will spread dirt and moss over a large area possibly leading to problems with neighbors. 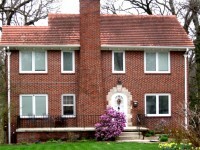 Will they treat your roof before or after to kill the moss and lichen spores (we do both)? If there is a problem will you ever see them again? Do you hate that moss on your roof? Are you tired of cleaning it off your footpaths, car etc. And then there are those birds on your roof every morning picking at it? That black unsightly staining on your tiles or slate isn't dirt, it's a bacteria called Gleocapsa Magma. It comes first and left untreated is followed by Lichen and Moss. 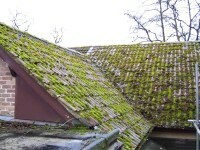 Moss and Lichen on the roof takes from the appearance of your house reducing its value. It is also bad for your roof. Left untreated it will continue to grow year after year feeding off of your tile or slate. It blocks up your gutters and down pipes and can lead to dampness. But it's in winter that it does most damage. 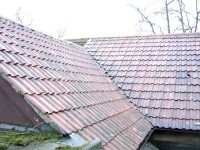 In the frost it expands in the joints and causes tiles or slate to break allowing water to seep into your house. GM Services specialize in roof cleaning without power washing. 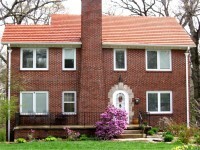 We can clean your tile or slate roof using our "Soft Wash System." GM Services are premium members of the Roof Cleaning Institute of America ("RCIA") and "Soft Wash Systems". Our process is environmentally friendly. GM Services offer a choice of cost effective options to treat your roof, including Roof Painting.